Various neighborhoods in New York City, New York. Territory in New Jersey, South Florida and Las Vegas. Made men (full members) are men of Italian descent. Other ethnicities are employed as "associates." The Lucchese crime family (pronounced [lukˈkeːze]) is one of the "Five Families" that dominates organized crime activities in New York City, United States, within the nationwide criminal phenomenon known as the Mafia (or Cosa Nostra). The family originated in the early 1920s with Gaetano Reina serving as boss up until his murder in 1930. It was taken over by Tommy Gagliano during the Castellammarese War, and led by him until his death in 1951. The family under Gagliano was peaceful and low key, concentrating their criminal activities in the Bronx, Manhattan and New Jersey. The next boss was Tommy Lucchese, who turned the family around to become one of the most powerful families to sit on the Commission. Lucchese teamed up with Gambino crime family boss Carlo Gambino to control organized crime in New York City. When Lucchese died of natural causes in 1967, Carmine Tramunti controlled the family for a brief time; he was arrested in 1973. Anthony Corallo then gained control of the family. Corallo was very secretive and soon became one of the most powerful members of the Commission. He was arrested and convicted in the famous Commission case of 1986. For most of its history, the Lucchese family was reckoned as one of the most peaceful crime families in the nation. However, that changed when Corallo named Victor Amuso his successor shortly before going to prison. Amuso later promoted one of his longtime partners, Anthony Casso to underboss. They instituted one of the bloodiest reigns in Mafia history, ordering virtually anyone who crossed them to be murdered. Amuso was arrested in 1991 and sentenced to life in prison. Several Lucchese wiseguys, fearing for their lives, turned informant. The highest-profile of these was acting boss Alphonse D'Arco, who became the first boss of a New York crime family to testify against the mob. This led to the arrest of the entire Lucchese family hierarchy, with Casso also becoming an informant. Testimony from these informants nearly destroyed the family, with as many as half of its members incarcerated. Amuso has continued to rule the family from prison. The early history of the Lucchese crime family can be traced to members of the Morello gang based in East Harlem and the Bronx. Gaetano "Tommy" Reina would leave the Morellos around the time of World War I and created his own family based in East Harlem and the Bronx. As the family's leader, Reina avoided the Mafia-Cammora War for control over New York City. He instead focused on controlling the home ice distribution business throughout New York City. During the early 1920s, Reina became a powerful prohibition era boss and aligned himself with Joseph Masseria, the most powerful Italian-American crime boss in New York. Masseria soon became involved in the Castellammarese War, a vicious gang war with rival Sicilian boss Salvatore Maranzano. At this point, Masseria started demanding a share of Reina's criminal profits, prompting Reina to consider changing allegiance to Maranzano. When Masseria learned of Reina's possible betrayal, he plotted with Reina lieutenant Tommy Gagliano to kill him. On February 26, 1930, gunman Vito Genovese murdered Reina outside his aunt's apartment. With Reina dead, Masseria bypassed Gagliano, who expected to take control of the Reina gang, and installed his underling Joseph "Fat Joe" Pinzolo as boss. Furious with this betrayal, Gagliano and Tommy Lucchese secretly defected to Maranzano. In September 1930, Lucchese lured Pinzolo to a Manhattan office building, where Pinzolo was murdered. With Masseria's murder on April 15, 1931, Salvatore Maranzano held a meeting at the intersection of 187th and Washington Ave. in the Bronx proclaiming himself the new Capo di tutti capi (boss of all bosses) of the American Mafia. Maranzano outlined a peace plan to all the Sicilian and Italian Mafia leaders in the United States. There would be 24 organizations (to be known as "families") throughout the country who would elect their own bosses. Maranzano also reorganized all the Italian-American gangs in New York City into five families to be headed by Maranzano, Lucky Luciano, Vincent Mangano, Tommy Gagliano and Joseph Profaci. Gagliano was awarded the old Reina organization, with Lucchese as his underboss. However, Luciano and other mob members did not want another top leader. When Maranzano learned about Luciano's disaffection, he hired a gunman to kill him. However, in September 1931 Luciano struck first. Several Jewish assassins provided by Luciano associate Meyer Lansky murdered Maranzano in his office. Luciano now became the most powerful mobster in New York. Luciano kept the family structure as created by Maranzano, but removed the boss of bosses in favor of a ruling body, The Commission. The Commission's responsibility was to regulate the families' affairs and resolve all differences between the families. The first Commission members included Luciano, Gagliano, Bonanno, Profaci, Mangano, Chicago Outfit boss Al "Scarface" Capone and Buffalo family boss Stefano Magaddino, with Luciano as chairman. Although the Commission was technically a democratic institution, it was actually controlled by Luciano and his allies. During the 1930s and 1940s, Gagliano and Lucchese led their family into profitable areas of the trucking and clothing industries. When Luciano was sent to prison for pandering in 1936, a rival alliance took control of the Commission. The alliance of Mangano, Bonanno, Buffalo crime family boss Stefano Magaddino, and Profaci used their power to control organized crime in America. Understanding his vulnerability, Gagliano was careful to avoid opposing this new alliance. Gagliano was a quiet man who avoided the media and stayed off the streets. He preferred to pass his orders to the family though Lucchese and a few other close allies. In contrast, Lucchese was the public face of the family who carried out Gagliano's orders. In 1946, Lucchese attended the Cosa Nostra Havana Conference in Cuba on behalf of Gagliano. Gagliano kept such a low profile that virtually nothing is known about his activities from 1932 until he retired or died between 1951 and 1953. After Gagliano's retirement or death, Lucchese became boss and appointed Vincenzo Rao as his consigliere and Stefano LaSalle as his underboss. Lucchese continued with Gagliano's policies, making the now Lucchese family one of the most profitable in New York. Lucchese established control over Teamsters union locals, workers' co-operatives and trade associations, and rackets at the new Idlewild Airport. Lucchese also expanded family rackets in Manhattan's Garment District and in related trucking industry around New York City. Lucchese built close relations with many powerful New York politicians, including Mayors William O'Dwyer and Vincent Impellitteri and members of the judiciary, who aided the family on numerous occasions. Throughout his regime, Lucchese kept a low profile and saw to it that his men were well taken care of. When Lucchese became boss, he helped Vito Genovese and Carlo Gambino in their fights to take control of their families. The three plotted to take over the Mafia Commission by murdering family bosses Frank Costello and Albert Anastasia. On May 2, 1957 Costello survived an assassination attempt and immediately decided to retire as boss in favor of Genovese. Then on October 25, 1957, the Gallo brothers (from the Colombo family) murdered Anastasia, allowing Gambino to become boss. Lucchese and Gambino started conspiring to remove their former ally Genovese. After the disastrous 1957 Apalachin meeting of mob leaders in Upstate New York, Genovese lost a great deal of respect in the Commission. In 1959, with the assistance of Luciano, Costello, and Meyer Lansky, Genovese was arrested. Gambino and Lucchese assumed full control of the Mafia Commission. In 1960, they backed the Gallo brothers in their rebellion against Profaci family boss Joe Profaci. Gambino and Lucchese saw the war as a way to take over rackets from the distracted Profaci's. After uncovering a plot by Joseph Bonanno to assassinate them, Lucchese and Gambino used the Commission to strip Bonanno of his role as boss. This power play started a war within the Bonanno family and served to strengthen both the Lucchese and Gambino families. In 1962, Gambino's oldest son Thomas married Lucchese's daughter Frances, strengthening the Gambino-Lucchese alliance. Lucchese led a quiet, stable life until his death from a brain tumor on July 13, 1967. At the time of his death, he had not spent a day in jail in 44 years. Lucchese left his family in a very powerful position in New York City. The Lucchese family had a stronghold in East Harlem, the Bronx and consisted of about 200 made members. Lucchese intended for longtime capo Anthony Corallo to succeed him. However, since he was imprisoned at the time, he named another longtime capo, Carmine Tramunti, as acting boss until Corallo's release. At the time of his appointment as temporary boss, Carmine "Mr. Gribbs" Tramunti was in ill health. With boss-in-waiting Anthony "Tony Ducks" Corallo in prison, Tramunti was expected to hold power until Corallo's release. Tramunti faced a number of criminal charges during his time as acting boss and was eventually convicted of financing a large heroin smuggling operation, the infamous French Connection. This scheme was responsible for distributing millions of dollars in heroin along the East Coast during the early seventies. Before the French Connection trial, the seized heroin was stored in the NYPD property/evidence storage room pending trial. In a brazen scheme, criminals stole hundreds of kilograms of heroin worth $70 million from the room and replaced them with bags of flour. Officers discovered the theft when they noticed insects eating the so-called heroin. The scope and depth of this scheme is still unknown, but officials suspect the thieves had assistance from corrupt NYPD officers. Certain plotters received jail sentences, including Vincent Papa (he was later assassinated in the Atlanta Federal Penitentiary in Atlanta, Georgia), Virgil Alessi and Anthony Loria. In 1974, after Tramunti's incarceration, Corallo finally took charge of the family. After Tramunti's incarceration in 1974, Anthony Corallo finally took control of the Lucchese family. Corallo came from the Queens faction of the family. Known as "Tony Ducks" from his ease at 'ducking' criminal convictions, Corallo was a boss squarely in Lucchese's mold. Corallo had been heavily involved in labor racketeering and worked closely with Jimmy Hoffa, the Teamsters president, during the 1940s and 1950s. Corallo also enjoyed close ties to the Painters and Decorators Union', the Conduit Workers Union, and the United Textile Workers Union. Corrallo appointed Salvatore "Tom Mix" Santoro as the underboss and supervisor of all labor and construction racketeering operations in New York, and Christopher "Christie Tick" Furnari as the reputed consigliere. The family prospered under Corallo's leadership, particularly in narcotics trafficking, labor racketeering, and major illegal gambling. Corallo never discussed business during sit-downs, fearing that the FBI was monitoring the conversations. Instead, he used the car phone in the Jaguar owned by his bodyguard and chauffeur's. Corallo was driven around New York while on the phone discussing business. Salvatore "Sal" Avellino and Aniello "Neil" Migliore shifted as Corallo's chauffeurs during the 1970s and 1980s. Corallo, a huge fan of the New Jersey faction of the family, reputedly inducted and promoted Anthony "Tumac" Accetturo and Michael "Mad Dog" Taccetta into the organization and put them in charge of the Jersey Crew, which reportedly controlled most of the loansharking and illegal gambling operations in Newark, New Jersey at the time. In the early 1980s, the Federal Bureau of Investigation (FBI) finally managed to plant a bug in the Jaguar. The FBI recorded Corallo speaking at great length about mob affairs, including illegal gambling, labor racketeering, drug trafficking, and murder. Corallo was arrested and put on trial along with all the heads of the Five Families at the time. This trial became legendary as the Mafia Commission Trial. On December 16, 1985, Gambino crime family boss Paul Castellano was murdered without Commission approval. The Genovese and Lucchese family teamed up and plotted John Gotti's murder. The alliance had Gambino underboss Frank DeCicco murdered but failed its attempts to kill Gotti. Corallo, Santoro and Furnari were indicted in the Mafia Commission Trial in 1986. As the trial wore on, Corallo realized that the entire Lucchese hierarchy was about to be decimated. Not only was it all but certain that he, Santoro and Furnari would be convicted, but they faced sentences that, at their ages, would all but assure they would die in prison. In the fall of 1986, Corallo chose Anthony "Buddy" Luongo as acting boss. However, Luongo disappeared in 1986. Corallo's ultimate choice was Vittorio "Vic" Amuso. Allegedly both Amuso and Anthony "Gaspipe " Casso were candidates for the job. Evidence suggests that Corallo wanted Casso, but Casso convinced him to select Amuso instead. Amuso officially became boss in January 1987, when Corallo, Santoro and Furnari were sentenced to 100 years in prison. Amuso made Casso his underboss in 1989, allowing him to exert great influence over family decisions. Corallo and Santoro died in prison in 2000, while Furnari was released in 2014. 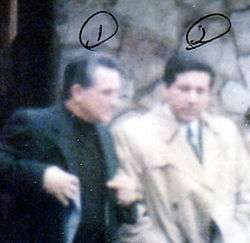 FBI surveillance photo of Casso (right) with Lucchese family boss, Vittorio Amuso. During the late 1980s, the Lucchese family underwent a period of great turmoil. Vittorio "Vic" Amuso and his fierce underboss, Anthony "Gaspipe" Casso, the first members of the family's Brooklyn wing to head the family, instituted one of the most violent reigns in American Mafia history. Both men were heavily involved in labor racketeering, extortion, drug trafficking and committed many murders. Amuso and Casso were strong rivals of Gambino crime family boss John Gotti and strong allies of Genovese crime family boss Vincent "Chin" Gigante. They made their reputations earlier in 1986. Angry over the murder of Gambino boss Paul Castellano, Corallo and Gigante conspired to murder Gotti. Corallo gave the contract to Amuso and Casso. On April 13, 1986 a car-bombing killed Gambino underboss Frank DeCicco, but missed Gotti. This assassination attempt sparked a long and confusing 'tension' between these three crime families with many deaths reported on all sides. During the late 1980s, Amuso began demanding 50% of the profits generated by the Jersey Crew. New Jersey leaders Anthony Accetturo and Michael Taccetta refused Amuso's demand. In retaliation, Amuso and Casso ordered the entire Jersey Crew killed—the now-infamous "whack Jersey" order. He summoned them to a meeting in Brooklyn. Fearful for their lives, all the Jersey crew members skipped the meeting and went into hiding. Taccetta and Accetturo were later put on trial in 1990, as both Amuso and Casso were implicated in a case involving the fitting of thousands of windows in New York at over-inflated prices, and the pair went into hiding of that same year, naming Alphonse "Little Al" D'Arco as acting boss. For the next few years, Amuso and Casso ruled the family from afar and ordered the execution of anyone they deemed troublesome, either they were considered rivals or potential informants. All of this convinced many Lucchese wiseguys that Amuso and Casso were no longer acting or thinking rationally. What followed next was a series of botched hits on family members suspected of being informants. Ironically, these hits caused several family members to actually turn informer. Amuso ordered the slaying of capo Peter "Fat Pete" Chiodo, who along with Casso was in charge of the Windows Case operation. He was shot 12 times, but still survived. After Amuso ordered hits on Chiodo's wife and sister in violation of longstanding rules against women being harmed, Chiodo turned state's evidence and provided the entire windows operation that eventually controlled $150 million in window replacements, sold in New York City. As Amuso also sanctioned the hit on Anthony Accetturo, who was on trial in 1990, he also cooperated with the government. The planned executions went as high as acting boss D'Arco. Furious over the failed hit on Chiodo, Amuso set up D'Arco to be killed at a Manhattan hotel. However, this hit also came undone after D'Arco saw a man hide a gun in his shirt, then slip it into the bathroom. Recognizing this as a classic setup for a hit, D'Arco fled for his life and turned himself over to the authorities to spare him and his family from Amuso and Casso and their increasingly erratic demands. He was the first boss of a New York crime family, acting or otherwise, to become an informant. 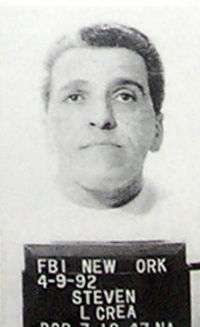 Casso had reportedly conspired with reputed consigliere Frank Lastorino and Brooklyn faction leaders George Zappola, George Conte, Frank "Bones" Papagni and Frank Gioia, Jr. into murdering Steven "Wonderboy" Crea, Amuso's acting underboss of the Bronx, as well as Gambino crime family acting boss John "Junior" Gotti, son of the imprisoned John Gotti, along with members of the Genovese crime family once again. But due to massive indictments, none of the plots were committed. Law enforcement eventually caught up with the two fugitives. On July 29, 1991, the FBI captured Amuso in Scranton, Pennsylvania, and on January 19, 1993 the FBI captured Casso in Mount Olive, New Jersey. Amuso steadfastly refused all offers from the government to make a deal and become a government witness. He was convicted on all charges in 1992 and sentenced to life in prison. In contrast, Casso quickly agreed to a deal on March 1, 1994 and started revealing family secrets. One of the biggest secrets was that Casso had been paying two New York Police Department detectives, Louis Eppolito and Stephen Caracappa, to provide Casso with sensitive police information and even perform to contract murders. Casso related how Eppolito and Caracappa, on Christmas Day 1986, murdered an innocent Brooklyn man who had the same name as a suspected government informant. Casso told the government that in 1992 Lucchese hit men tried to kill the sister of another suspected informant, violating the alleged Mafia "rule" barring violence against family members. However, in 1998, prosecutors tore up the deal after accusing Casso of lying about other mob turncoats and bribing guards, among other things. As a result, the court ordered no leniency for Casso at his sentencing, and he was sentenced to 13 consecutive terms of life in prison. When Amuso went to prison, he chose Joseph "Little Joe" DeFede to be his acting boss. Throughout the mid-1990s Amuso continued to control the family from prison. DeFede, who supervised the powerful Garment District racket, reportedly earned more than $40,000 to $60,000 a month. DeFede placed Steven Crea in charge of the family's labor and construction racketeering operations. Crea increased the Lucchese family earnings from these rackets between $300,000 and $500,000 every year. But as US law enforcement kept pressuring the organized crime activities in New York, DeFede was arrested and indicted on nine counts of racketeering in 1998. DeFede pleaded guilty to the charges and was sentenced to five years in prison. Angry at DeFede's guilty plea, Amuso promoted Crea as the new acting boss. Steven "Wonderboy" Crea's success with the labor and construction rackets convinced Amuso that DeFede had been previously skimming off these profits. In late 1999, Amuso placed a contract on DeFede's life. On September 6, 2000, Crea and seven other Lucchese members were arrested and jailed on extortion charges, mostly to the supervising of the construction sites with various capos Dominic Truscello and Joseph Civitello. After Crea's imprisonment, the consigliere Louis "Lou Bagels" Daidone, took control of the family. However, Daidone's tenure was short lived. After his release from the prison, the scared DeFede became a government witness and helped the government convict Daidone of murder and conspiracy. Daidone's conviction was also helped by the testimony from Alphonse D'Arco in September 2004. In 1994, Casso revealed that two respected New York City police detectives worked as hitmen and informants for Casso during the 1980s and early 1990s before their retirement. They were Louis Eppolito and Stephen Caracappa, who spent much of their combined 44 years with the NYPD committing murders and leaking confidential information to the Lucchese family. Between 1986 and 1990, Eppolito and Caracappa participated in eight murders and received $375,000 from Casso in bribes and payments for murder 'contracts'. Casso used Caracappa and Eppolito to pressure the Gambino crime family by murdering several of their members. This is because Casso, along with the imprisoned Amuso and Genovese crime family boss Vincent Gigante, wanted their rival John Gotti out of the way. Caracappa and Eppolito are now seen as the main source of 'tension' between these three families during the late 1980s and early 1990s. For one contract, Eppolito and Caracappa kidnapped mobster James Hydell, forced him into their car trunk, and delivered him to Casso for torture and murder. Hydell's body was never found. The two detectives also shot Bruno Facciolo, who was found in Brooklyn in the trunk of a car with a canary in his mouth. After pulling Gambino crime family captain Edward "Eddie" Lino for a routine traffic check, the detectives murdered him on the expressway in his Mercedes-Benz. In April 2006, Eppolito and Caracappa were convicted of murdering Hydell, Nicholas Guido, John "Otto" Heidel, John Doe, Anthony DiLapi, Facciolo, Lino, and Bartholomew Boriello on the orders of Casso and the Lucchese family. They were sentenced to life imprisonment. With the arrest of acting boss Louis Daidone in 2003, imprisoned boss Vic Amuso put a three-man ruling panel to run the family. The panel consisted of capos Aniello Migliore, Joseph DiNapoli and Matthew Madonna who brought the family's power back into the Bronx. On December 18, 2007, two members of the panel Joseph DiNapoli and Matthew Madonna were arrested along with New Jersey faction capo Ralph V. Perna, soldier Nicodemo Scarfo, Jr. and others. The arrested came after New Jersey law enforcement agencies revealed that through investigation Operation Heat the New Jersey faction controlled a $2.2 billion illegal gambling, money laundering and racketeering ring from New Jersey to Costa Rica. On October 1, 2009, the Lucchese family was hit with two separate indictments charging 49 members and associates with bribery and racketeering. In the first indictment 29, members and associates of the Lucchese family were arrested. The indicted charged Joseph DiNapoli, Matthew Madonna and acting capo Anthony Croce with running operations that nearly grossed $400 million from illegal gambling, loansharking, gun trafficking, bribery and extortion. In the second indictment obtained from investigation "Operation Open House" 12 more Lucchese mobsters were charged with bribery. Acting capo Andrew Disimone and other mobsters were charged with bribing New York Police Department (NYPD) detective and sergeant posing as crooked cops to protect illegal poker parlors. Although in prison for life, Victor Amuso remains the official boss of the Lucchese crime family, with Steven Crea serving as the current acting boss. Amuso has been boss for almost a quarter-century but it is unclear how much influence he had over the crime family's day-to-day affairs in later years. From 2003-2009, a three-man ruling panel consisting of Aniello "Neil" Migliore, Joseph DiNapoli and Matthew Madonna had been running the family. Arguably, Migliore, DiNapoli and Madonna brought stability to the Lucchese family during the 2000s. The family's presence remains strong in the Bronx, Manhattan, Queens, Long Island, Yonkers and New Jersey. A February 2004, New York Post article stated that, the Lucchese family consisted of about 9 capos and 82 soldiers. In March 2009, an article in the New York Post stated that the Lucchese family consisted of approximately 100 "made" members. In late 2009, the Lucchese family was handed three federal indictments showing that the family continues to be very active in organized crime, especially in labor racketeering, illegal gambling, and extortion. In one of the indicitments ruling panel members Joseph DiNapoli and Matthew Madonna were charged with controlling a ring that extorted and bribed businesses and construction sites in Manhattan and the Bronx. Also in 2009, Steven Crea's parole expired and consigliere Joseph Caridi was released from prison after serving almost six years. On January 16, 2013, the FBI arrested 29 members and associates of the Genovese, Lucchese and Gambino crime families on racketeering charges related to their involvement in carting companies in Westchester County, Rockland County and Nassau County in New York, and Bergen County and Passaic County in New Jersey. Members and associates of the Genovese, Lucchese and Gambino crime families controlled waste disposal businesses by dictating which companies could pick up trash at certain locations and extorting protection payments preventing further extortion from other mobsters. In June 2013, the New York FBI office reduced the number of agents, focused on investigating the five crime families to thirty-six agents, divided into two squads. In the past the FBI had a separate squad of 10 to 20 agents investigating each crime family. Currently, the FBI has "squad C5", which at one time solely investigated the Genovese family, but will now also be investigating the Bonanno and Colombo families, and "squad C16", which previously investigated just the Gambino family, but will now be investigating the Lucchese family as well. 1973–1986: Anthony "Tony Ducks" Corallo: indicted on February 15, 1985, convicted on November 19, 1986 in the Mafia Commission Trial and sentenced on January 13, 1987 to 100 years in prison. The street boss is considered the go-to-guy for the boss and is responsible to pass on orders to lower ranking members. In some instances a Ruling panel (of capos) substituted the Street boss role. 2003–2009: Ruling panel: Aniello Migliore, Joseph DiNapoli and Matthew Madonna: two members DiNapoli and Madonna were indicted and arrested in 2007 and in 2009. Acting 1990–1992: Anthony "Bowat" Baratta: imprisoned in June 1992. Boss Vittorio "Vic" Amuso — became boss in 1986 and remains the official boss of the crime family. Amuso has been imprisoned since 1992 and continues to rule the family from prison. Acting Boss Steven "Wonderboy" Crea — became underboss in 1993 then acting boss in 1998. On September 6, 2000, Crea along with other Lucchese family members was indicted and charged with extortion and supervising various construction sites in New York City. In January 2004, Crea was sentenced to 34 months in prison. Crea was released from prison on August 24, 2006. Crea became acting boss in 2009. Consigliere Joseph "Joe C." Caridi — operating from Long Island and Queens. Caridi was imprisoned on extortion and loansharking charges and was released on November 27, 2009. Joseph "Joey Dee" DiNapoli — served on a ruling panel that ran the family from 2003–2009 along with Aniello Migliore and Matthew Madonna. In December 2007, DiNapoli and Madonna were arrested along with members of the New Jersey faction on illegal gambling charges. On October 1, 2009 DiNapoli and Madonna were indicted in a racketeering scheme that involved mob-tied building inspectors and soliciting bribes to overlook violations. Matthew "Matt" Madonna — served on a ruling panel that ran the family from 2003–2009 along with Aniello Migliore and Joseph DiNapoli. In December 2007, Madonna and DiNapoli were arrested along with members of the New Jersey faction on illegal gambling charges. On October 1, 2009 Madonna and DiNapoli were indicted on racketeering, illegal gambling and bribery charges. John "Johnny Hooks" Capra — was indicted in 2005 along with members of the Gambino crime family on extortion and illegal gambling charges. Capra was released from prison on September 10, 2008. Anthony "Blue Eyes" Santorelli — during the 1990s, he led The Tanglewood Boys, a Mafia recruitment gang. Joseph "Big Joey" Lubrano - a capo alleged to have ties across New York more strongly to the Bronx faction. During the 1990s, he was wrongfully convicted of beating and robbing a black police officer and was sentenced to 15 years imprisonment, during his second year in prison for the crime he was released after authorities mistook him for another Lucchese family look-alike mobster. It was at the trial that he was identified as having ties to the crime family. In May 2010, the FBI listed him as wanted for armed robbery and racketeering, he was captured in September of that year. He was released four years later after capture. Aniello "Neil" Migliore — was released from prison on May 14, 1997. He served on a ruling panel that ran the family from 2003–2009 along with Joseph DiNapoli and Matthew Madonna. Dominic "Crazy Dom" Truscello — runs the Prince Street Crew. On September 6, 2000, Truscello, Steven Crea and Joseph Tangorra were charged with bid rigging, corrupting construction labor officials among other crimes. In 2003, Truscello plead guilty to extortion. On January 9, 2006, he was released from prison. Carmine Avellino - current captain in the Lucchese family. He is the brother of Salvatore Avellino who was the driver of deceased Lucchese crime family boss Tony Ducks Corallo. In 2014, Avellino was charged with ordering two Lucchese family associates to assault a 70-year-old man over a late payment of $100,000. Domenico "Danny" Cutaia — runs the Brownsville Crew. On October 25, 2009, he was sentenced to three years in prison for bank fraud. Cutaia was released from prison on October 4, 2013. John "Big John" Castelle — runs the Bensonhurst Crew. On November 12, 2000 Castelle was charged along with brother underboss Eugene Castelle and others on drug trafficking, extortion and loansharking operations in Bensonhurst, Brooklyn. On October 20, 2004 he was released from prison. Ralph Vito Perna — runs the New Jersey faction. In December 2007, Peran was arrested along with DiNapoli and Madonna and other members of the New Jersey faction on illegal gambling charges. Joseph "Joey" Giampa — was found guilty in August 1995 of conspiring to establish gambling operations and racketeering in New Jersey. On September 21, 2001, Giampa was released from prison. The Lucchese family has taken over unions across United States. The crime family has extorted money from the unions in blackmail, strong-arming, violence and other matters to keep their control over the market. Similar to the other four crime families of New York City they worked on controlling entire unions. With the mob having control over the union they control the entire market. Bid-rigging allows the mob to get a percentage of the income on the construction deal only allowing certain companies to bid on jobs who pay them first. The mob also allows companies to use non-union workers to work on jobs the companies must give a kickback to the mob. Unions give mob members jobs on the books to show a legitimate source of income. The Mafia members get into high union position and begin embezzling money from the job and workers. Clothes manufacturing - In the Garment District of Manhattan, the Union of Needletrades, Industrial and Textile Employees Locals 10, 23, 24, and 25 were controlled by members of the Lucchese family. Lucchese associates would extort the businesses and organize strikes. Today some unions still are working for the family. Kosher meat companies - In the early 1960s Giovanni "Johnny Dio" Dioguardi merged Consumer Kosher Provisions Company and American Kosher Provisions Inc. together. Dio was able to control a large portion of the Kosher food market, forcing supermarkets to buy from his companies at his prices. Food distribution - At the Hunts Point Cooperative Market in the Hunts Point section of the Bronx, the Lucchese family controlled unions involved in the food distribution industry. Airport services and freight handling - At John F. Kennedy International Airport, LaGuardia and Newark Liberty, the unions were controlled by the Lucchese family. Construction - Teamsters unions in New York City and New Jersey have been under Lucchese control; Mason Tenders Locals 46, 48, and 66 were controlled by the old Vario Crew. Newspaper production and delivery - In November 2009, Manhattan District Attorney Robert Morgenthau sent search warrants to investigate the Newspaper Mail Deliverers Union. This union controlled circulation, production and delivery offices at The New York Times, The New York Post, The New York Daily News and El Diario La Prensa. When the Cosa Nostra took control over the union, the price and costs for newspapers increased. Charges were put against many union members as well as the former union President Douglas LaChance. LaChance is accused as being Lucchese crime family associate. In the 1980s LaChance was convicted on labor racketeering charges and served five years in prison. He was also involved in the Manhattan 1990s case were New York Post was being strong-armed into switching their delivery companies, but was acquitted in the case. In 1969, in the novel The Godfather (and in the 1972 film and 2006 videogame), the Cuneo crime family is based on the Lucchese crime family. As the Lucchese, the Cuneo family is largely active in The Bronx and New Jersey. He's historically "invisible" of the authorities and is involved mainly in labor racket and gambling, as the Lucchese. In the 1981 film Gangster Wars, Gaetano "Tommy Brown" Lucchese was played by actor Jon Polito. The 1990 film Goodfellas was based on Henry Hill's recollections about his involvement with The Vario Crew of the Lucchese family. In the 1991 film Mobsters, Tommy Reina was played by actor Christopher Penn. In the 1991 film Out for Justice, the William Forsythe character "Richard Madano" was allegedly based on Lucchese mobster Matthew Madonna. The 1999-2007 HBO TV-show The Sopranos, main character Anthony Soprano was based on Lucchese mobster Michael Taccetta. In 2005 and 2006, a fictionalized version of The Tanglewood Boys was featured on CSI: NY, in episode 1.13 "Tanglewood" and in episode 2.20 "Run Silent, Run Deep". The 2006 film Find Me Guilty, was based on the 1980s trial of 20 members of the Lucchese Jersey Crew. In the 2007 film American Gangster, the Armand Assante character Dominic Cattano was allegedly based on Lucchese mobster Carmine Tramunti. In the 2008 Rockstar North's video game Grand Theft Auto IV, the fictional Lupisella family resembles on the Lucchese family. The Lupisella family is mainly based in Bohan, the Grand Theft Auto IV version of the Bronx, and is operating in Liberty City, the game's version of New York City. 1 2 3 4 5 6 7 Raab, Selwyn. The Five Families: The Rise, Decline & Resurgence of America's Most Powerful Mafia Empire. New York: St. Martins Press, 2005. ↑ McPhee, Michele (July 7, 2002). "FUHGEDDABOUD THE OLD MOB After Gotti, Mafia ordered to clean house". New York Daily News. Retrieved 15 April 2012. ↑ leagle.com. "U.S. v. Casso - June 29, 1998". Leagle.com. Retrieved 2012-11-16. ↑ Peterson, Helen (July 1, 1998). "WISEGUY WON'T GET FED AID ON SENTENCE". New York Daily News. Retrieved 15 April 2012. ↑ "State of New Jersey". Nj.gov. 2006-07-19. Retrieved 2012-01-02. 1 2 3 4 Claire Heininger (December 18, 2007). "Names of those charged in $2.2B gambling ring". Statehouse Bureau. Retrieved August 9, 2013. 1 2 3 4 5 6 7 Martinez, Jose (October 2, 2009). "49 indicted for bribery, racketeering schemes on a crazy Lucchese mob day". New York Daily News. Retrieved 13 April 2012. 1 2 Capeci, Jerry (July 24, 2014). "Vic Amuso Begins 24th Year In Federal Custody As Luchese Family Boss". Gangland. Retrieved July 27, 2014. ↑ McShane, Larry; Gearty, Robert (January 16, 2013). "Mob sweep! Feds clean up the garbage with arrest of 30 suspected wise-guys in solid waste industry probe; two more expected to surrender". New York Daily News. Retrieved August 3, 2013. ↑ Rashbaum, William; Goldstein, Joseph (January 16, 2013). "Extortion Charges for 29 Tied to Trash-Hauling Industry". New York Times. Retrieved August 3, 2013. 1 2 3 Rashbaum, William (June 28, 2013). "F.B.I. Will Fight the Mafia With Fewer Investigators". New York Times. Retrieved August 3, 2013. 1 2 "Lucchese crime family officially has new boss". Mafia Information. 2012-02-23. Retrieved 2012-11-16. 1 2 3 Capeci, Jerry (May 4, 1998). "DUMB FELLAS GRADS' DREAM OF MOB GLORY DIED BEHIND PRISON BARS". New York Daily News. Retrieved 15 April 2012. ↑ Claffey, Mike (December 11, 2002). "FEDS BUST L.I. 'SOPRANOS' Say mobsters put bite on restaurant". New York Daily News. Retrieved 13 April 2012. ↑ Gray, Geoffrey (March 10, 2005). "Massive Indictment Rocks Gambino Family". New York Sun. Retrieved August 5, 2013. ↑ "Federal Bureau of Prisons: Inmate Locator "John Capra"". Bop.gov. Retrieved August 5, 2013. ↑ McAlary, Mike (March 13, 1998). "A Case of Dumb and Dumpster". New York Daily News. Retrieved August 5, 2013. ↑ "THE WRONG GUY GOT JAIL IN 1994 ATTACK". Mike Mcalry. The New York Daily Times. May 22, 1998. Retrieved 16 May 2016. ↑ "FBI New York Wanted Fugitive Joseph Lubrano Arrested". FBI. FBI. Retrieved 16 May 2016. ↑ "Bureau of Prisons Inmate Locator: "Aniello Migliore"". Bop.gov. May 14, 1997. Retrieved August 9, 2013. ↑ "Bureau of Prisons Inmate Locator "Dominic Truscello"". Bop.gov. Retrieved 2012-01-02. ↑ "Notorious gangster charged with using mob goons to collect money from 70-year-old deadbeat". John Marzulli. The New York Daily News. May 13, 2014. Retrieved 16 May 2016. ↑ Marzulli, John (October 23, 2009). "No sympathy for sick mobster Domenico Cutaia suffering from MS - judge throws the book at him". New York Daily News. Retrieved 15 April 2012. ↑ "Federal Bureau of Prison Inmate Locator: Domenico Cutaia". Bop.gov. Retrieved 2012-01-02. ↑ "Federal Bureau of Prisons: Inmate Locator "John Castellucci"". Bop.gov. Retrieved August 9, 2013. ↑ "Six Are Found Guilty Of Mob-Related Crimes". New York Times. August 8, 1995. Retrieved August 10, 2013. ↑ "Federal Bureau of Prisons: Inmate Locator "Joseph Giampa"". Bop.gov. Retrieved August 10, 2013. ↑ The Editors of Newsday (1975). The Heroin Trail. New York: Holt, Rinehart and Winston. ISBN 0-03-013841-8. ↑ Bruno, Anthony. "Real Life Sopranos". TrueTV Crime Library. Retrieved October 28, 2012. Mass, Peter. The Valachi Papers, New York: Pocket Books, 1986. ISBN 0-671-63173-X.